This pattern uses either the new Es-o beads or superduos to weave a pretty, lacy band of alternating units into a cuff of as many rows as you choose. 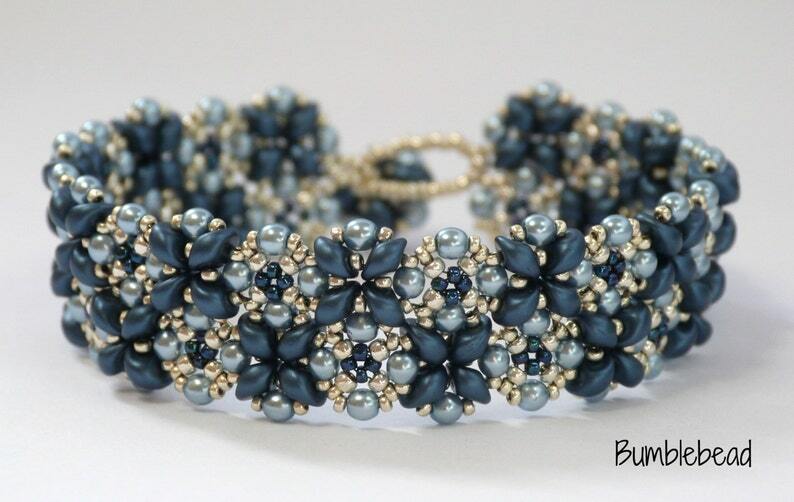 If you use Es-o beads they create a beautiful texture of raised flowers with receeded seed bead units. Alternatively it can be stitched as one single strand, as a simple bracelet or as part of a series of stacking bracelets. It can be stitched with only seed beads as a repeating single unit as well. You can play with the colours in it, alternating them or varying them however you choose. It provides huge scope for bead play! It would also make a beautiful bag strap or work well stitched to fabric as an embellishment. 100 3mm pearls (approx.) - 3mm fire polished beads or 3mm bicones would work in their place. These materials make a final bracelet of approx. 18.5cm (7 ¼ inches) in my tension. I am happy for you to sell items made using the tutorial locally, in galleries and at local craft fairs. I do not permit the selling of items made using the tutorial on the internet. I also do not permit mass production of items made using the tutorial. Please credit me as the designer. Please note, the pattern is written in ENGLISH only. The photographs are clear and detailed so many beaders will manage to create pieces using the photographs alone. I'm wearing the new bracelet I made over the weekend and love it! Many patterns do not work up the same way they look in pictures, but not with this pattern! I'm very pleased with the outcome and it looks better than it does in the photo. I did three rows on mine as I prefer a "cuff" look - it worked up beautifully! Thank you! well written tutorial, well illustrated too. Thanks! Payment should be made via Paypal or credit/debit card / Etsy pay as soon as you have placed your order. Failure to do so will result in your order being delayed. I hope that you will be delighted with your purchases. • Intimate items (for health/hygiene reasons) such as earrings. Refunds will only be given upon return of your order, unused and in the original packaging. Your refund will include the original cost of your purchase, including the postage, but will not include the cost of return postage. Please contact me if you have any questions. Please be aware that I cannot accept returns on custom pieces unless faulty.